Whilst these stands may be intended for use with Q Acoustics own speakers, they are actually remarkably useful for a wide variety of other designs, and thanks to their intelligent construction they are very good sounding. Supplied as a flat pack they feature two different sized top plates (W11cm x D16.5cm intended for the 2010/i and W13cm x D23.2cm for the 2020/I) making them perfect for use a wide variety of speakers. To damp the steel legs a polystyrene insert is provided for the round tube and a foam block for the rear ‘U’ section. Spikes are supplied for the base and to attach the speakers we recommend using blu tack on the screw heads that secure the top plate. They have a sound that is open without any intrusive colouration's, and whilst they can’t match the weight and scale of the dearer stands we offer they are remarkable for the price and are the best budget stand we’ve found by quite a margin. The OTS (short for Open Tube Stand) is a new speaker stand design from Something Solid. It’s a hand built in the UK fully welded design with a very carefully considered design ethos (as you’d expect from Something Solid). It is a remarkably low mass design, the tube wall is intentionally kept thin and made using a grade of steel selected for its sound quality. The top and bottom use a clever curved steel cross so that large flat plates of steel, as found in most other designs, can be avoided (as their resonance's can be very audible). As you’d expect with a low mass design the sound is wonderfully open, lucid and fast (high mass tends to slow the sound, skewing timing and shutting the mid range down). These are an exceptionally well judged budget stand and will bear comparison with many much more costly and complex designs. What’s more, there’s no assembly required and no messing filling of the tube, simply fit the spikes, add four small blobs of blutack and you’re away. 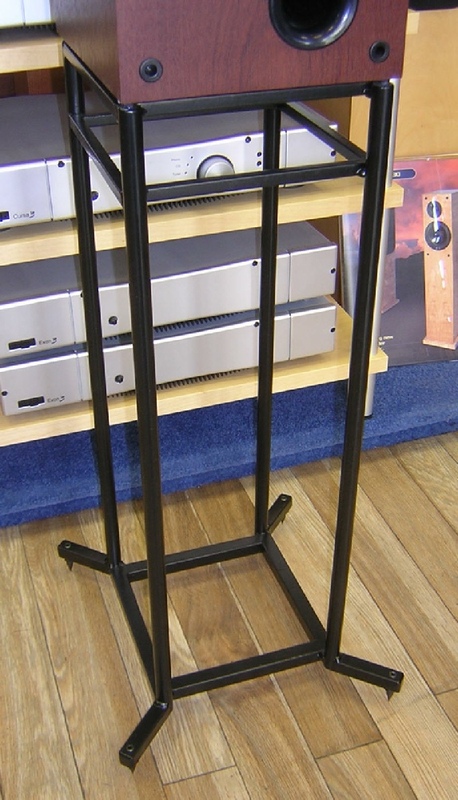 The SL (short for Structural Logic) speaker stand is a wonderfully simple concept, it uses a central column that is an unfilled thick walled steel pillar which is welded to 25 x 10mm steel bar to give it its support. The designer has been careful to exclude plate steel from the stand as he feels (and we would concur) that they add unwanted resonance’s. The steel used is carefully selected to be both ‘soft’ and the material used thick enough that it doesn’t ring substantially and therefore doesn’t need filling (adding mass invariably ruins the timing of the low frequencies), which keeps the sound wonderfully open and fast. These are stunningly good stands, and not just considering their low price, they are capable of exploiting the strengths of almost anything you place on top of them, from budget speakers to many hi end mini monitors. The top size is approximately 15cm wide by 17cm deep and we recommend using small pea sized pieces of blu tack to mount the speakers onto the stands for best performance. They are available in Black and Silver finishes (Silver whilst stocks last). 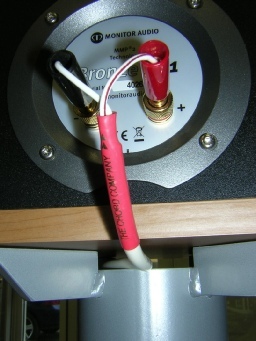 The stands even allow for the cable to be run discretely inside them, as pictured below. 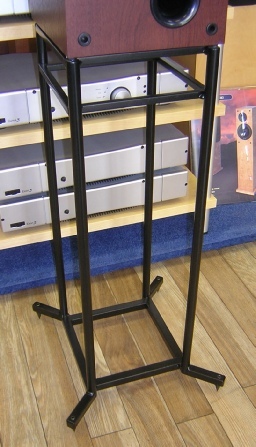 The XF is the current top of the range speaker stand from Something Solid. These stands are made from solid steel bar (not hollow tube), which is welded throughout to ensure absolute rigidity. Carbon Fibre pucks are fitted to the top to support the speakers, although a little blu-tack can also be used to ensure vibration is minimised (especially recommended with lighter speaker cabinets). Its foolish to say that any speaker stand is the best for every system but I have yet to find a speaker that doesn’t work on them. Loudspeakers that sounded congested and ill defined before will come to life, sounding quicker and much less coloured. Even though this stand is a relatively low mass design it seems to rewrite the rules as it even works under speakers that were intended to be used on lead filled behemoths! 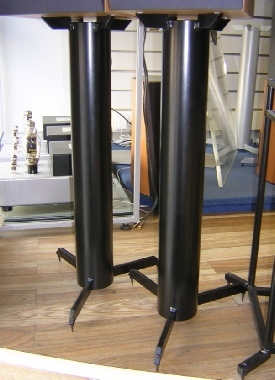 These stands are made to order as the height, top width and top depth can be specified to ensure a perfect match with your loudspeakers (almost any speaker can be catered for). The stands are finished in a satin Black powder coated finish as standard, other finishes may be possible but will cost extra (please call for details). Please note, when the height of the stand is specified it excludes floor spikes, so please remember to add about 2cm to any calculations to the overall height. 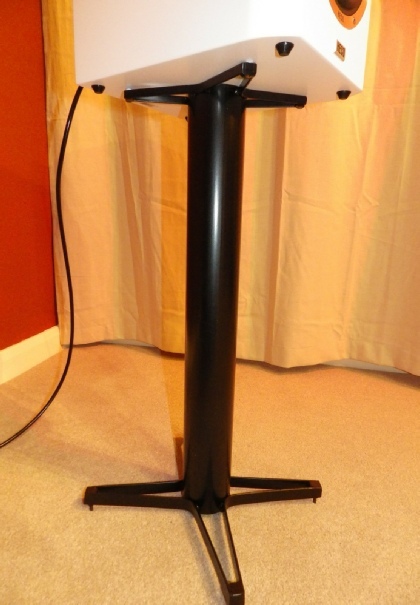 Special versions with inset rear outriggers for speakers that are intended to be used in corners (such as the larger Audio Note models) are available for no extra charge. The most popular sizes ordered include designs for the following loudspeakers: Harbeth Compact 7/Super HL5/P3, Proac Tablette/Response series/Studio series, ATC SCM20/SCM50/100, Audio Note AN-E/J, Various other BBC designs including LS3/5a, Yamaha NS1000 and many more. 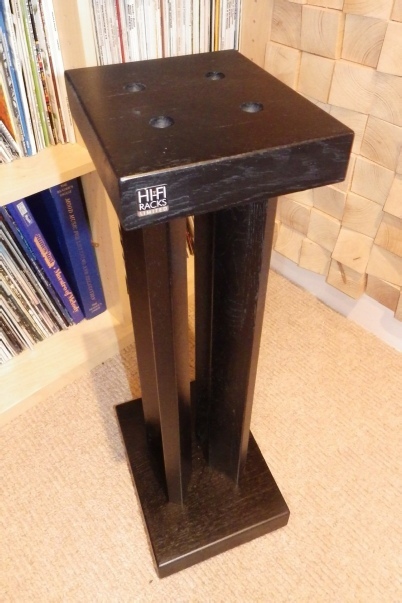 Something Solid Missing Link feet, highly recommended for use under speaker stands, a set of 8 cost £220 if purchased at the same time as the stands (a saving over their normal price). 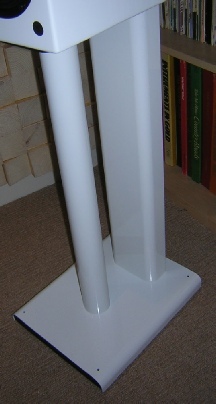 So as an example a stand measuring 60cm tall, with a speaker width of 20cm and a depth of 30cm (60+20+30=110) would fall well within standard pricing. For stands that exceed this please contact us for a quote. 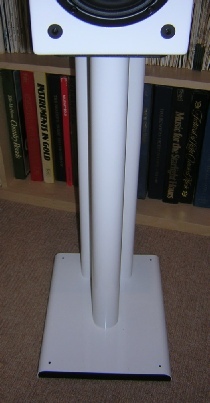 Please note that if the height exceeds 70cm an optional side brace can be requested, this adds £20 per pair of stands. If the height exceeds 100cm (as they can do in some studio applications) additional bottom bars are required and add £40 to the price.